Planning a birthday party or a bachelorette? You should check out Party Monsterz, a party props supply store in Gachibowli. It has everything from party hats to photo booth props. 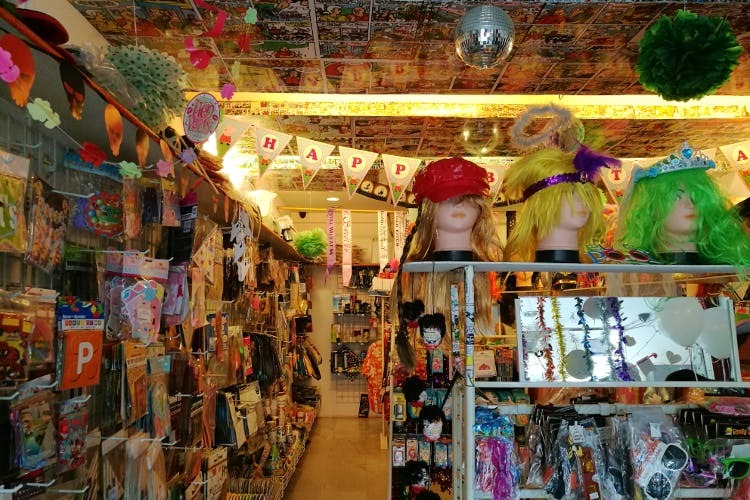 Walking through the store, we put on party hats, fancy masquerade masks and looked at glorious disco balls hanging from the ceiling. Party Monsterz is a paradise as far as balloons are concerned. Because here you will find literally every kind — from those on-trend letter foil balloons, metallic balloons and more. Plus, colourful ribbons, and other party decor props too. We found fairy wings, tutu skirts and pirate kits for children, and sashes with ‘Beauty Queen’ and ‘Bride To be’ among others printed across them. Tiaras too, for birthday girls to rock on can be bought from here. There were wigs, with rainbow hair, bright red or blue hair, and coloured Afro wigs too. On the racks, we saw badges with some of the favourite cartoons among kids, stickers and cut outs of Cinderella and Mickey Mouse. They have a dedicated section for photo props too which are quite a trend these days. So, be it a wedding photo booth, or just to click some awesome selfies with your squad at a birthday bash, you know where to find the right props. A corner in the store is also dedicated to theme based costumes for Halloween and Disney themes. Party planners, you can get fairy lights from here too! If you’re seeking a wild party experience, let us tell you that drinking games and adult games are available here too. So wait no more, and throw a dashing party by decorating your home, and getting a tad bit quirky with these party supplies.